I’ve recently mentioned at length on my Instagram about my sudden unbearable anxiety levels. I’ve always been very open about my battles with anxiety and it’s a demon I live with but am often able to keep at bay. 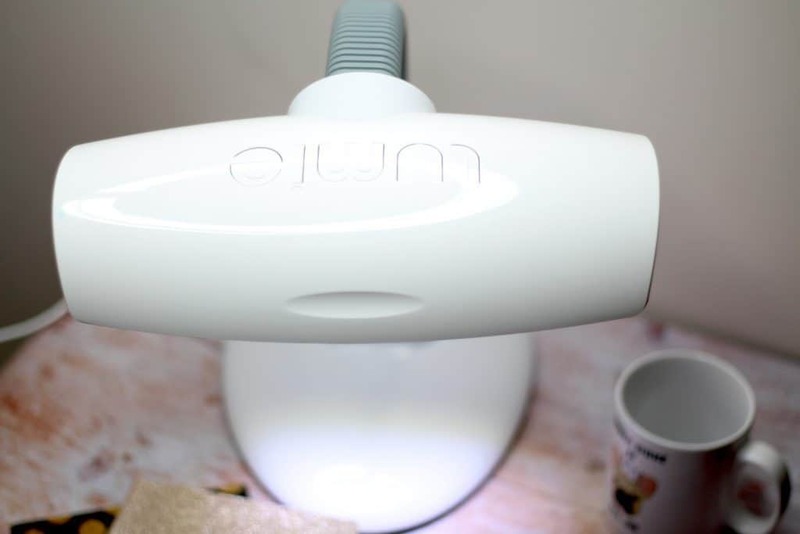 Since the end of Summer, I have been struggling so when I had the chance to try the Lumie desk lamp I was excited to see if it would help. One of my first jobs when I left college was in a basement mail room of a call centre. There were no windows and I spent most of an eight-hour day down there. I was leaving my house before sunrise and I was arriving home long after sunset because it was the depth of Winter in England. This was six days a week and before long it had a taken a huge toll on my mental health. I was miserable with no motivation or inspiration and that spark I was known for was gone. I felt tired all the time and I was highly emotional. Eventually I took a two-week holiday where I caught some much-needed sun! Within days I felt better and my mood had lifted. I put it down to overwork and being the first ‘real’ full time job I had done. However, within a week of being back in the basement office my symptoms returned. I had no idea what this was but I spoke to my GP who explained to me that I had the classic symptoms of Seasonal Affective Disorder or commonly known as SAD. SAD is caused by the lack of bright light over Winter which has an impact on hormone production. I spoke to my manager at work and transferred to a different department that wasn’t in the basement and became mindful of my lack of exposure to bright light in Winter. Moving out of the basement at my first job helped my symptoms hugely but recently I have been noticing some differences in my mood and motivation. I now live in Manchester which isn’t renowned for its sunny weather. In fact, despite the fact I work in my home office that has two huge windows in Winter it’s still very dark. I’ve been noticing a huge increase in my anxiety levels and my motivation has sunk to a new low. I feel tired all the time and no matter what time I go to sleep waking up in the morning is near impossible. My alarm goes off which of course I snooze and then I get up later than I would like and the school run is a mad rush. I’m not starting my days well and that’s having a huge knock on effect into the rest of my day. I never considered that this was a mild case of SAD creeping in again I just assumed it was life. However, rewind three months ago I was jumping out of bed at 5am and getting so much more done and I felt good about it. Whereas the last few weeks I have felt so crippled with anxiety I have wanted nothing more than to curl up under the duvet and hide from everything. 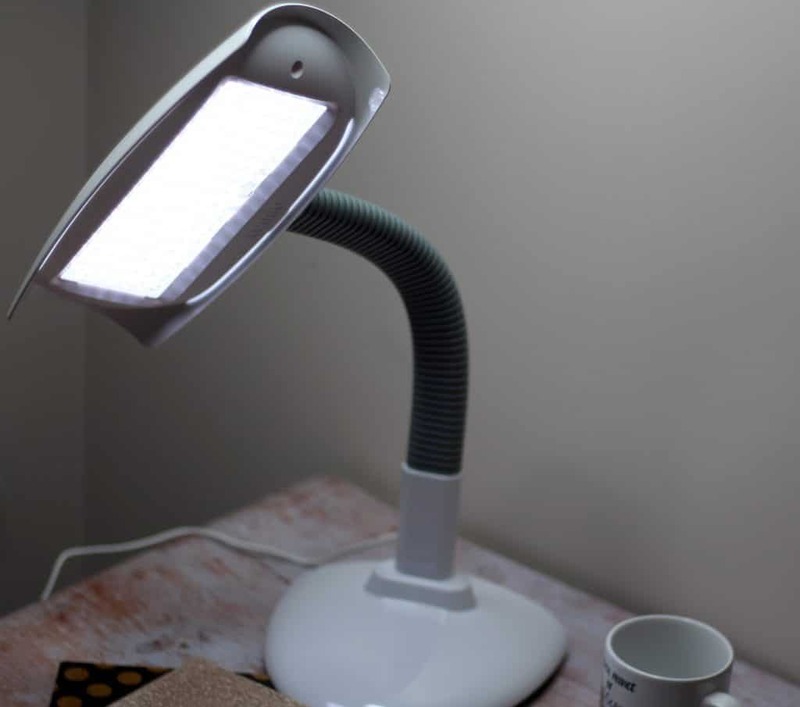 The Lumie desk lamp can be used daily to help keep those light levels topped up and help banish the symptoms that are associated with SAD. It was certainly worth a try I couldn’t feel any worse than I already did. 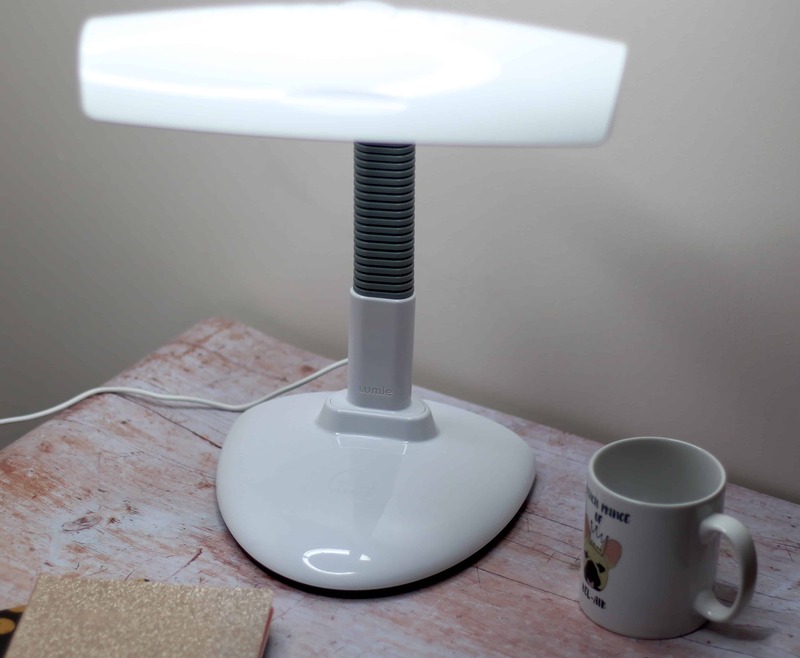 The Lumie desk lamp is a stylish design that fits in well on my office desk. The neck of the lamp is adjustable which makes positioning it simple. It’s recommended that you sit under the lamp for 60 minutes but if you are short on time you can remove the diffuser and you only need 30 minutes. Of course, if you have the lamp on a lower setting the time needed increases but 30 minutes a day is absolutely achievable. When I wake up in the morning after I have made a drink I sit with the lamp on and go through any emails or other gentle tasks. I find this helps me wake up. Once I’ve done the school run I sit back under the lamp and get on with some work. If I know I won’t be at my desk much I remove the diffuser for a quicker boost. I’ve been doing this every day for the past week and at first I only noticed a real minimal difference. However, after reading the instruction manual it does say you should notice a difference after three or four days in a row. I must admit that my concentration levels are much higher and my motivation is back. Although the mornings can sometimes be difficult they are much better than a week ago. My anxiety has reduced significantly and although it’s not fully banished it’s back to being manageable and for that alone I am incredibly grateful. Although how I have been feeling this past few weeks is nothing compared to how I felt during my time in my basement job It’s still clear that the Winter months are having an impact. 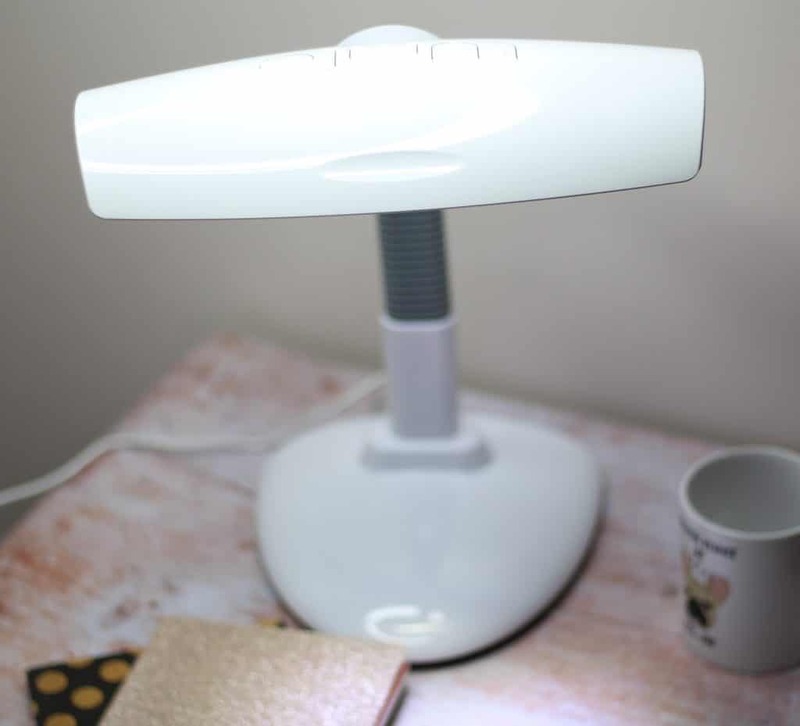 It’s incredible that those symptoms can be eased by a simple 30 minutes of light therapy I can do in the comfort of my own home and whilst I am still working! I’m really impressed with the Lumie desk lamp I love how it looks and how easy it fits in with my décor. It’s really simple and easy to use and I am very happy with the results it is having on my mood and motivation. Have you ever experienced symptoms of SAD? Would you consider light therapy? Let me know in the comments below. 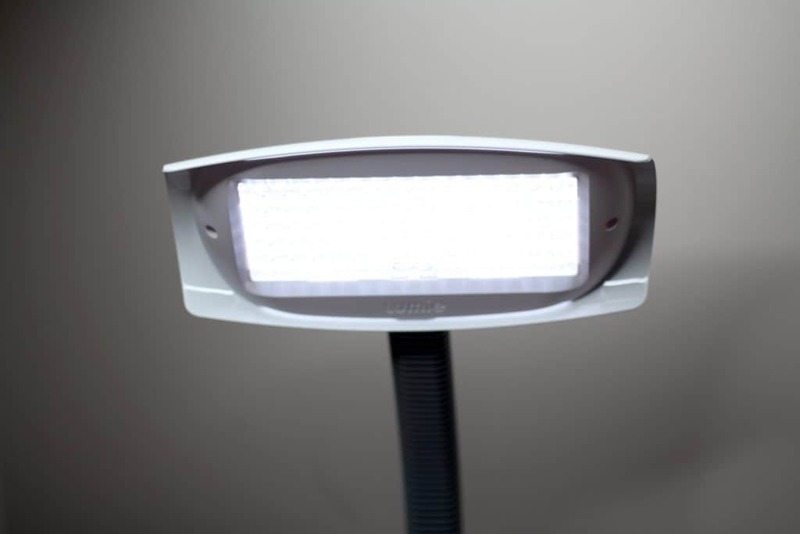 For more information on light therapy options from Lumie then head over to their website here. Thank you so much for stopping by if you enjoyed this post then check out some other reviews here! 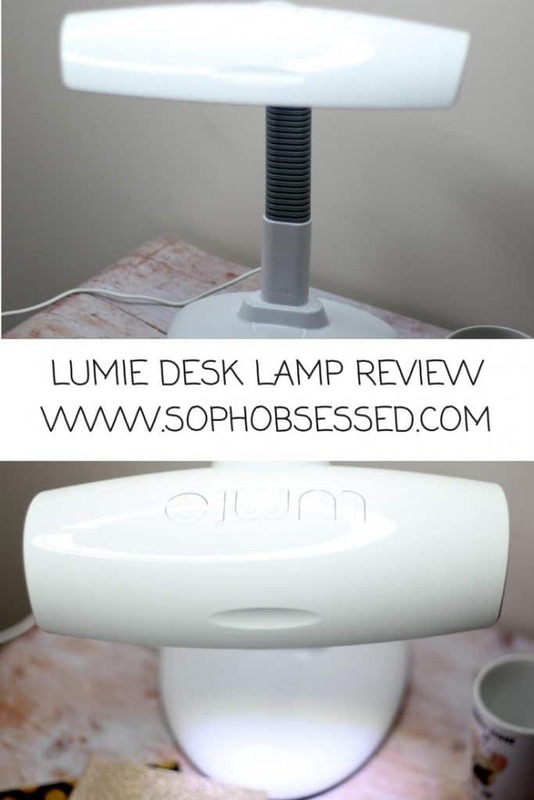 I received the Lumie desk lamp on a gifting basis in return for an honest review however as always all words, opinions and thoughts are my own! For more information on any of this please visit this page.